Plagued with premonitions of disaster, he fights to save others' lives. What Bobby doesn't foresee is that rescuing a stranger from death will place him in the line of fire. This definitely wasn't my typical kind of book, but I ended up really enjoying it! Bobby was an easy character to relate to, and I liked that he gained a new community over the course of the book and grew to be more courageous. The changes in perspective were all timed well to build suspense, and it was so fascinating to see the mysteries unravel surrounding Bobby's roommate, his premonitions, and the Servant. Any readers who like suspense with some paranormal elements should definitely check out this series! I absolutely loved the pull between good and evil in this story because it mimics real life, in my opinion. We all are battling good and evil, even within our own minds. When evil attempts to kill good in this story, I kind of had to think about that because evil is a trusted friend of good. In true life, evil is often disguised as a good friend, and we don't know it until it's too late and damage has been done. I love the author's writing style and the way she builds the suspense throughout a chapter and then leaves the reader hanging and switches to another character/chapter. It's what keeps me listening and rating the story with 5 stars. I hope book two is just as suspenseful. Paul McSorley does an outstanding, professional job with his narration. Nice, clean audio. A slow starting novel. The performance, however, was outstanding. Bobby is definitely a reluctant hero but it will be interesting to see where the mantel of servitude takes home in future books. 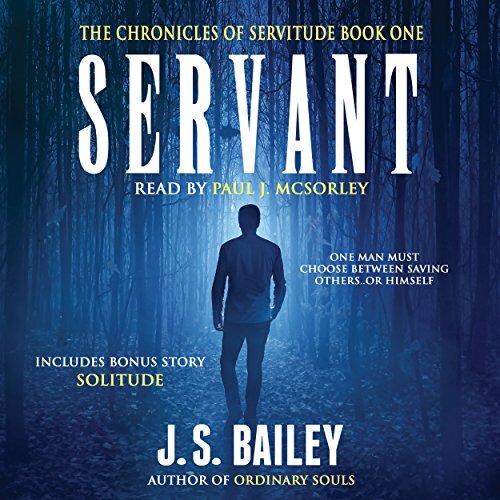 What made the experience of listening to Servant the most enjoyable? I have listened to other performances by Paul J. McSorley. He always does a great job. Great book. You will enjoy it. Didn't want to put it down. Narrator captured the story's essence. The little extra at the end was a treat! I can't wait for the next in the series. At so many points in this book I was left with questions that only made me want to delve further into story. I was very pleased to have listened to this story. The narrator also did a wonderful job. Wouldn't mind listening to more of his work as well. The plot of the story is superbly written and conceived. It is a mix of the evils in this word (seen and unseen) and the requirement of faith to face and defeat these evils. I was hooked from the first chapter. The narration performance was spot on with very entertaining and definitive characters having been portrayed. Excellent story telling of an excellent story. I'm not into religious books and this one was just on the edge for me. I would listen to the rest of the series tho. it was more paranormal than religious. the narration was great, and I found it entertaining.